Happy Fourth of July! This is such a wonderful (but crazy hectic) time of year for us! A visit to all the grandparents, aunts and uncles has been a joy! It's always bittersweet going back to your hometown and see all the familiar sights and faces, yet there's so much that has changed and, in fact, you yourself aren't the same person you used to be either... Moving is strange like that, I suppose. But more to the point of this post, I've been noticing an increased interest in Sunday School printables, so I want to share more with you today. We've decided to take our Sunday School down a notch or two during the summer. The barn-turned-community center we're meeting in has a great playground just outside that the kids can't resist this time of year! The teachers still bring a craft and have a story, but it's much more relaxed! 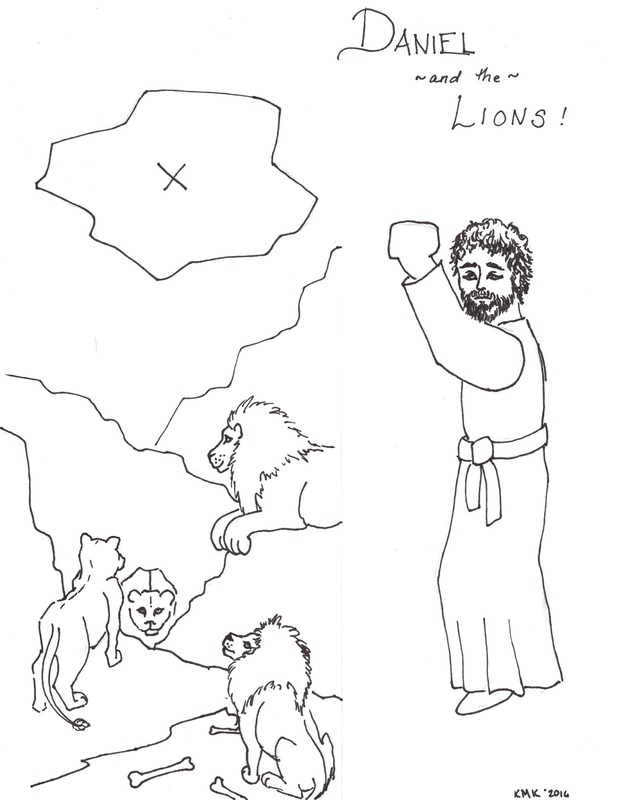 One of the last lessons we completed before our break was that of Daniel in the Lion's Den and I thought I'd pass along the printable of the craft we made to go with it. And of course, there's always Veggie Tales! But the original story is from the book Daniel chapter 6. If you're not super familiar with it, it makes more sense if you read the five chapters previous. To set up, I moved the tables into a big square and threw a bunch of pillows in the center to create a "den" that the kids all climbed into to hear the story that morning. They had a ball all pretending to be lions! To complete the craft, after everything is colored in as you want it, cut the paper vertically to separate the den section, then the opening in the ceiling. Next cut the outline of Daniel out. Attach yarn/string to the back of Daniel's hand for him to hold on to as he is lowered into (and later raised from) ﻿the den. I like to tape the other end of the string to the back of the rectangle, too so pieces don't get separated. Then all together it works as a teaching tool as your reading the story or for the little ones to play with later. There are so many great Sunday School programs out there, but sometimes you just need one story, and for that purpose, I hope some of you can find this useful! I hope we can impart to our kids what faith looks like and how awesome and in-control our God is! He knows what we're going through and when we choose to be faithful, just like Daniel. Free Printable of Daniel for Sunday School, wow what a great celebration of 4th of July by these kids. Keep it up and share more of their work. Such a great idea! Greatly appreciate the free printable too! Thank you! I’m so glad you can put it to use!